Stevia is an herb that’s much sweeter than sugar and is calorie free! It does not cause a spike in blood-sugar after eating and is safe for diabetics. A sweetener that is actually good for you! Stevia is safer and healthier than artificial sweeteners. 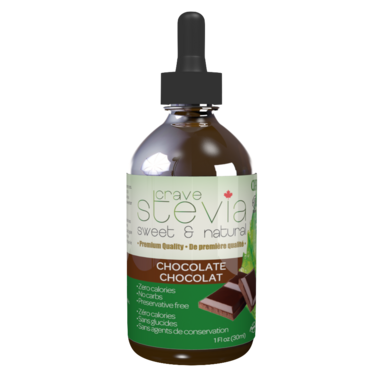 Stevia is heat stable meaning that it is ideal for baking and cooking. It is also great for teas and coffees, adding flavour and sweetness to smoothies, yogurt, cereal, or just mixed with water. Great taste and great value. It is nice to see they are Canadian as well. It's ok. I think I would just buy regular stevia next time. The chocolate didn't stand out enough for me when I added it to my coffee.